With a broad range of air-care, wash-care and clothing-care products that have passed our scientific standards and have been CERTIFIED asthma & allergy friendly®, LG has developed an entire ecosystem of healthier products. To showcase this healthier range of innovative products to their consumers, LG team has developed a landing page dedicated to the Certification Program. LG’s new landing page gives some great background to the Certification Program and lists all the benefits of the CERTIFIED products. Only the most innovative LG products have passed our strict scientific standards to receive the Certification. When a product passes our Certification Standards, it is then scientifically proven to reduce exposure to asthma and allergy triggers. As consumers are increasingly concerned about the quality of their environment and as the air within our homes has shown to be potentially more polluted than the outdoor air (click here to read article from the EPA), LG has been investing in this new market to try and help their customers create healthier homes. 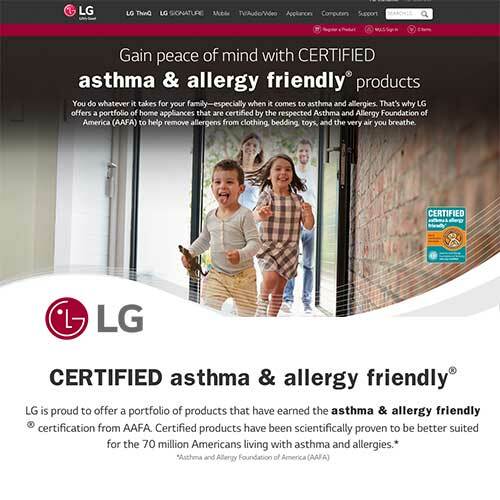 Thanks to the asthma & allergy friendly® Certification Program, LG is able to ensure their consumers that the claims carried by these certified products are trustworthy. 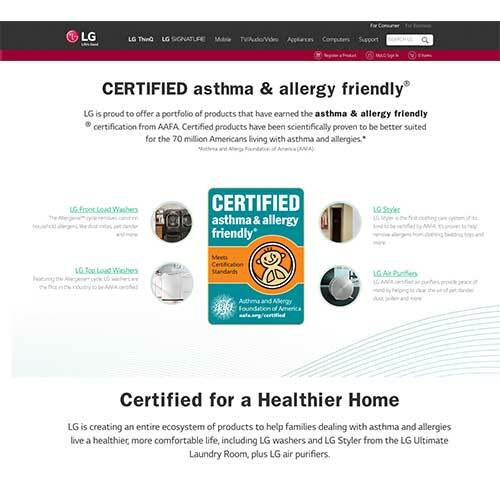 As explained by LG team on the new landing page, the Certification gives the consumers peace of mind of knowing that these products are scientifically proven to be better suited to the 1 out of 5 Americans with asthma and allergies.